Kura river, running from Turkey to the Caspian sea, through Georgia and Azerbaijan, is defined by geographers from ancient and modern times as one of the borders between Europe and Asia, along with the Rioni river and the Caucasus mountain range. 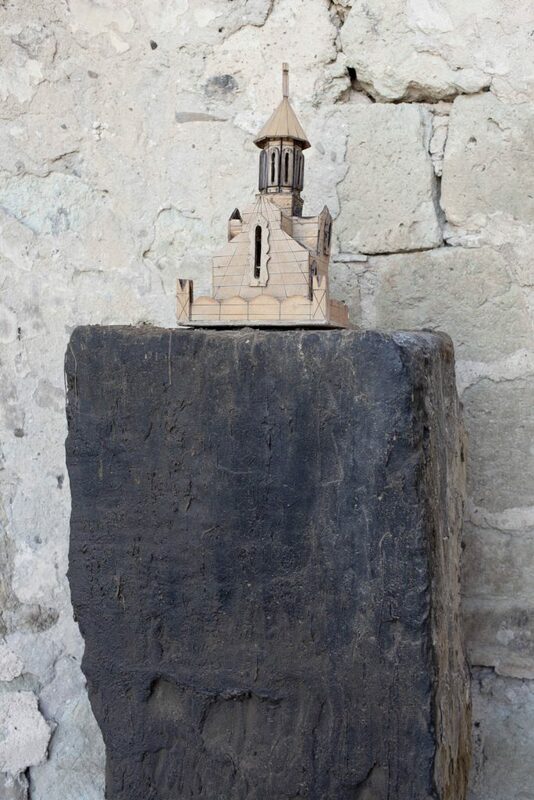 Kura has been produced and presented in the famework of Fest-INova 2017, Tbilisi, Georgia, with the support of the local Villa Garikula Art Center. 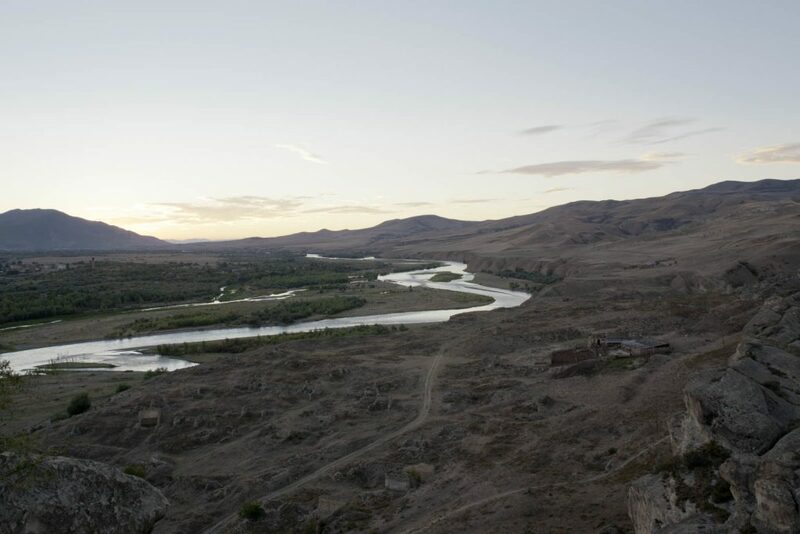 A view of the Kura river from the Uplistsikhe archaeological site. A map highlighitng the regions of Georgia actually under Russian occupation, in the exhibition “The Soviet Occupation, 1921-1991”, hosted in the Goergian National Museum in Tbilisi. The Stailn Museum in Gori, hometown of Jusif Stalin. The town was bombed by Russian air force during the 2008 Russo-Georgian war. 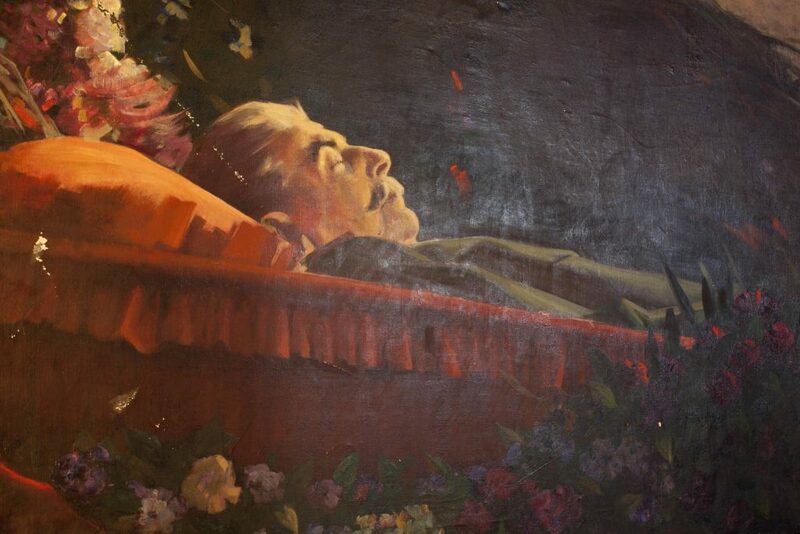 The funerary portrait of Stalin painted by is official personal painter, in the Stailn Museum in Gori, hometown of Jusif Stalin. [caption id="attachment_477" align="alignnone" width="683"] Garikula village, georgia. 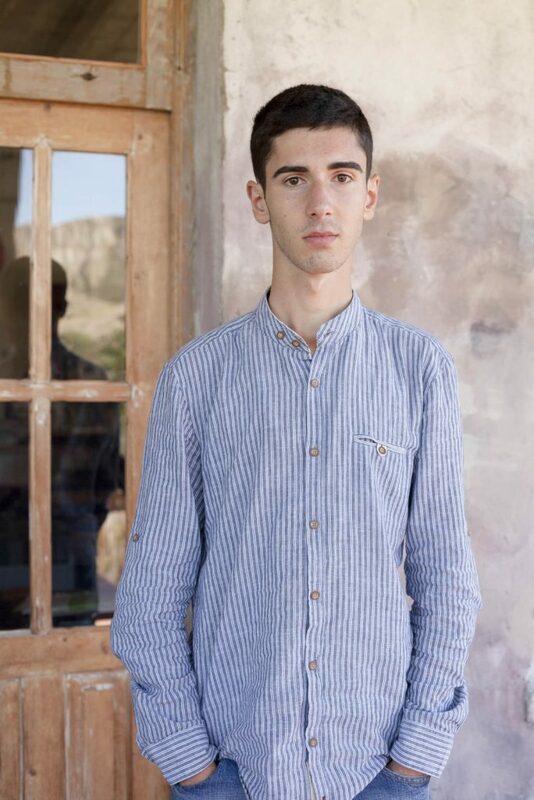 Solomon (16), a young artist at the Villa Garikula Art Center. 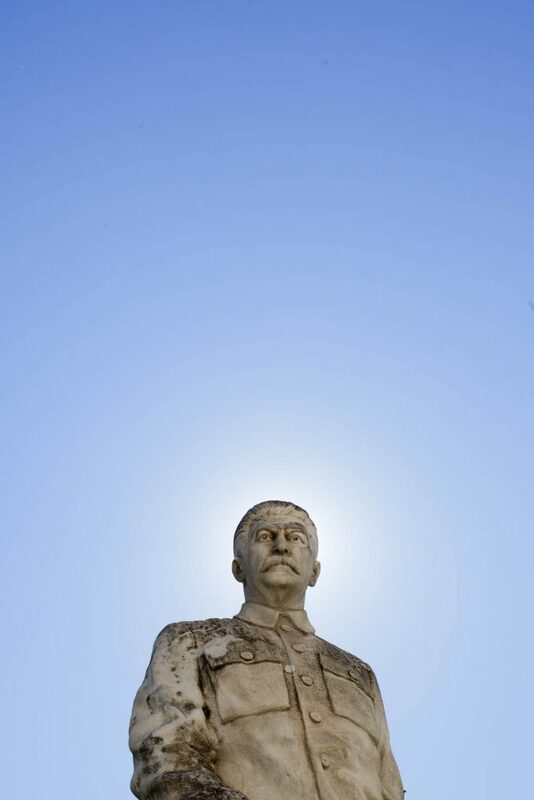 The statue of Stalin in front of the Stalin Museum in Gori, hometown of the Soviet politician. 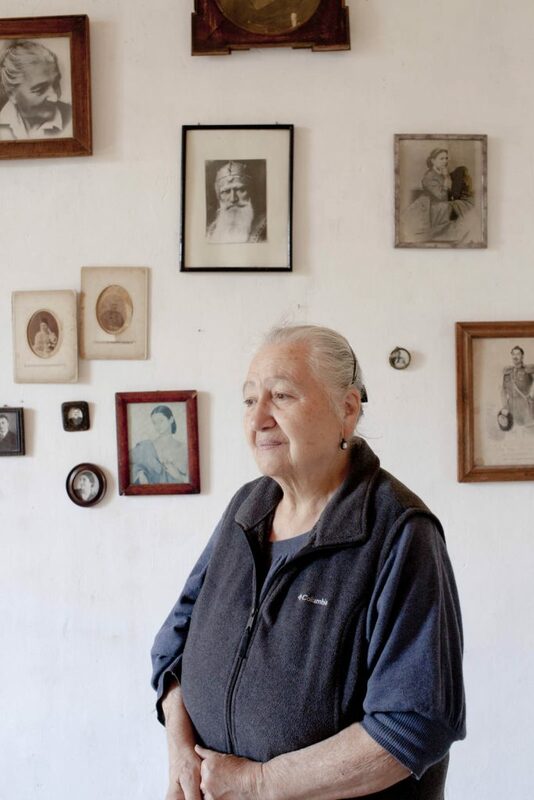 Manana Lajava De Surviladze, in the Marshal’s Villa, an ancient palace still belongin to her family. A room of the Marshal’s Palace. Goga (17) in his familiy home. Zeolite, for its characteristics of microporosity, was estracted here and in many other location in the Soviet Union, to be transported in Chernonbyl, in the aftermath of the disaster of 1986, to build decontaminatio barriers. an inhabitant of Garikula village. Hotel Inturist in Stalin Avenue. 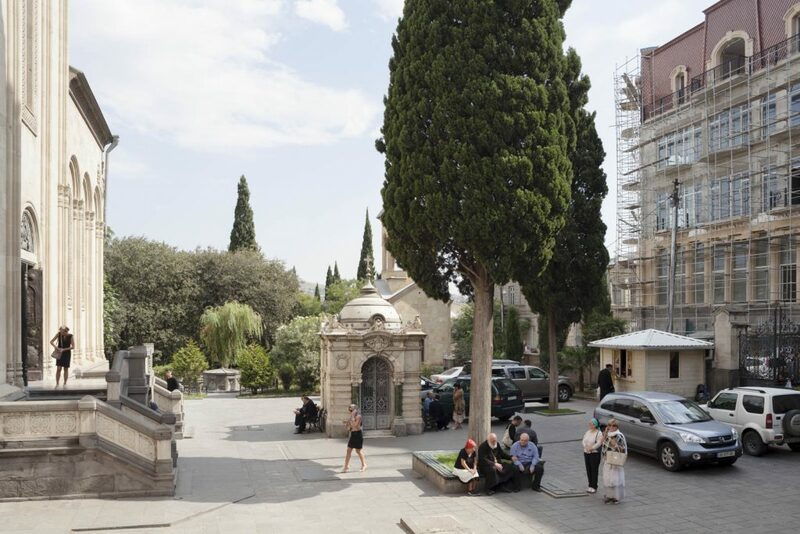 Walking in Rustaveli Avenue in Tbilisi, from Parliament to Freedom Square, is very helpful in understanding how Georgia faces the heritage of South Ossetian wars of 1991 and 2008. The building at number 3 is the headquarters of the Georgian National Museum, which houses the Museum of Soviet Occupation since the opening, in May 2006, of the homonymous permanent exhibition “The Soviet Occupation, 1921-1991”. 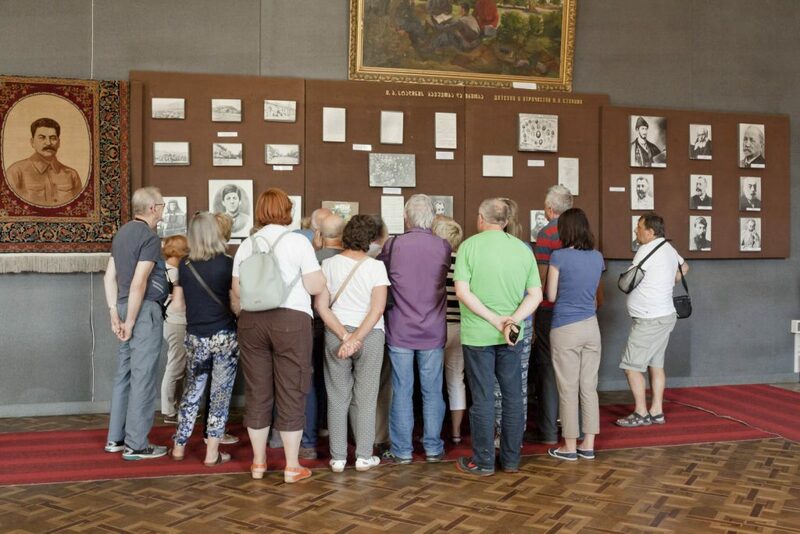 The exhibition itinerary is evident in the title and stops in ‘91 with a map that, besides highlighting of an intense red the Abkhazia and South Ossetia regions, reports an equally red inscription in English: “OCCUPATION CONTINUES”. 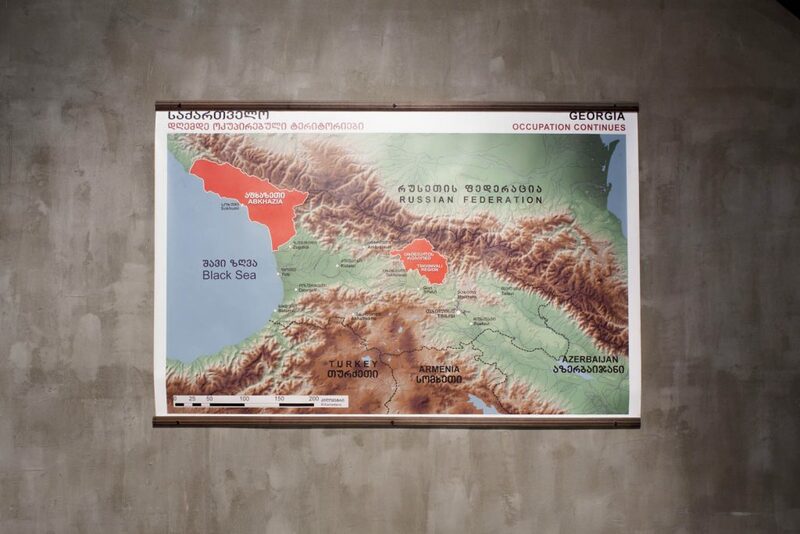 The map is not an ancient relic or a work of art, it has been produced by the curators of the exhibition as a clear and precise reference to the subsequent Russo-Georgian war of August 2008. Therefore it is a political statement. A few steps from the Museum of Soviet Occupation, across the street there is the Parliament building on which, next to the Georgian red crossed flag, waves the European one, although Georgia is not part of the EU, nor has begun (at least officially) the negotiations on the enlargement process. In fact the EU flag stands on many Georgian public buildings since Mikhail Saakashvili, on the occasion of his election as President of Georgia in 2004, said: “The European flag is the flag of Georgia, as it represents our civilization, our culture, the essence of our history and our perspectives, and our vision of the future of Georgia. “ Another political statement. After 500 meters, Rustaveli Avenue ends in Liberty Square, Lenin Square until 1991, where a sign in gold letters indicates the location of a “Information Center on NATO and EU,” which provides information to citizens, curious to know what exactly Georgian presidents, from Shevardnadze on, mean when they talk about freedom from the Soviet chains. As an under-40 Italian, new to any pro-European or pro-NATO propaganda (superfluous in our country), I do not quite understand the utility of this office. 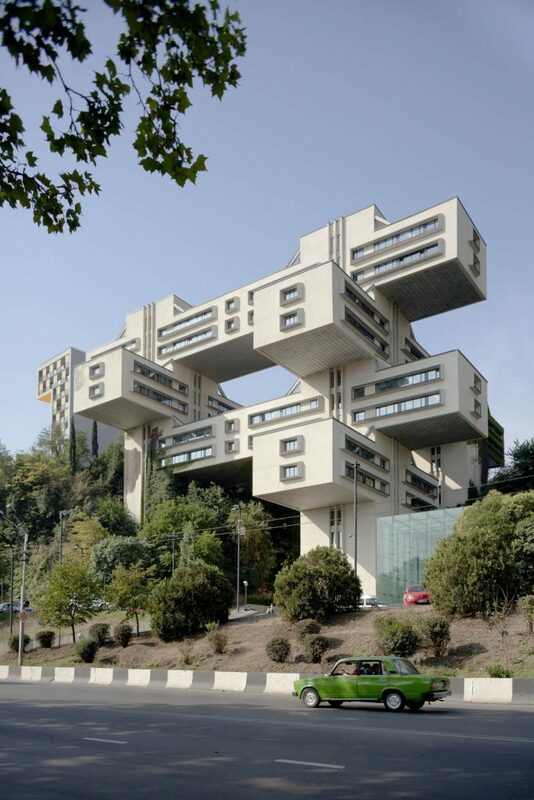 I am rather impressed by the boldly constructivist architecture of the former Soviet Ministry of Roads, a few kilometers north, which became in 2007 the head office of the Bank of Georgia and therefore a perfect metaphor of the national trends towards the Western system. With unintended irony, all that happens on the Kura River which, besides splitting Tbilisi, is indicated, since Anaximenes, as the boundary that divides Europe from Asia. The pre-Socratic philosopher meant the two continentale plates, but now, with hindsight of history, two systems, two approaches, two worlds. Karaman, Georgian painter 57 years, clarifies my thoughts. He tells me that all the Georgian politics from Independence onwards is played on this game-field, and that here one must distinguish, rather than between left and right, between pro-Russian parties on one side and pro-European, pro-American, pro-NATO parties on the other. I understand from his words that in Georgia, as in many other Eastern European countries, you still can not talk about “left” without evoking the Bolshevik spectrum and that only artists and intellectuals are beginning to manipulate the term, although discreetly, in the meaning that we know in central Europe. Karaman lives in Garikula, a village about two hours from the capital, in a large house built in 1885 by Polish architect and engineer Vasily Bolgarski. Karaman who manages the house since the ‘90s, has transformed it from artists’ squat to cultural enterprise, recognized and supported by the Georgian Ministry of Culture and now home to the Art I Nova Fest, an annual festival of contemporary art that attracts here at the village not only the cultural community of Tbilisi but also international artists and curators. The inhabitants of Garikula and surrounding villages regularly frequent the Villa looking for a bit of a cultural movement that otherwise you may find only in Tbilisi and nowhere else within a hundred kilometers of mostly agricultural areas, purchased, at best, by some European multinational such as Ferrero, which produces here the nuts for its chocolate snacks. Among the villagers I meet Georgi (an evidently widespread name in Georgia) who has long lived in Italy, speaks a very correct Italian, and it is here in Garikula temporarily, to visit his relatives who remained at home. 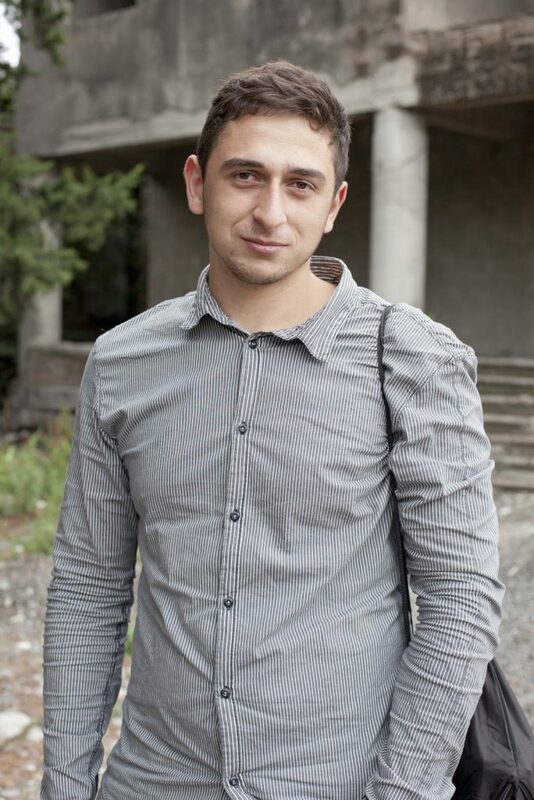 Georgi immediately proposes himself as a guide and translator, happy and surprised to meet international peers in his hometown. I ask him whether he knows someone here in the village who participated in the wars in 91 ‘or 2008, and he responds with a firm “Sure I know them!” A veteran of ‘91, a young man of 2008, still in service Tbilisi, a “rambo” a bit out of his mind, now retired, among others. Good, I think, but in a few days I realize that the matter is not so simple, because the veteran is elder and who knows when he wants to meet us, the young man is indeed in Tbilisi in service, and it is better to leave the “Rambo”on his own. Besides Georgi, I notice a widespread reticence on the issues related to the two conflicts, although Garikula is a place that has suffered many consequences of the recent wars. 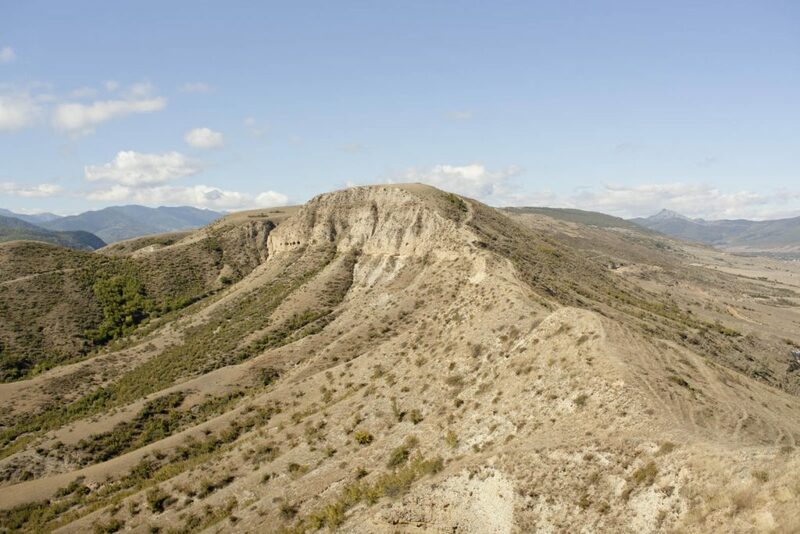 It is located in the Shida Kartli region, which borders the breakaway region of South Ossetia. In a straight line, we are about 20 km from the border and from here to Tskhinvali, the main theater of war in 2008, it takes an hour by car, if not for the bans to cross the border, asserted firmly on both sides. 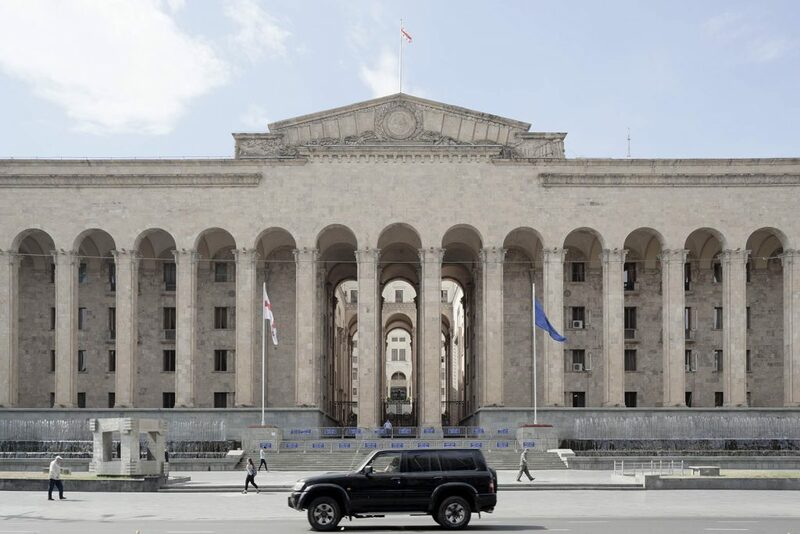 The Georgian authorities consider South Ossetia under Russian occupation to all intents and purposes and do not hesitate to assert its territoriality in front of the international community. However, the Georgian-Russian friction dates back to the aftermath of the October Revolution, and has ramifications still visible on the territory, connected to new frictions, and thus justifying the reluctance in this regard. Just a few minutes from Villa Garikula, I visit another important historical building in the area that the locals call, literally translating into English, “Marshal’s Palace”. 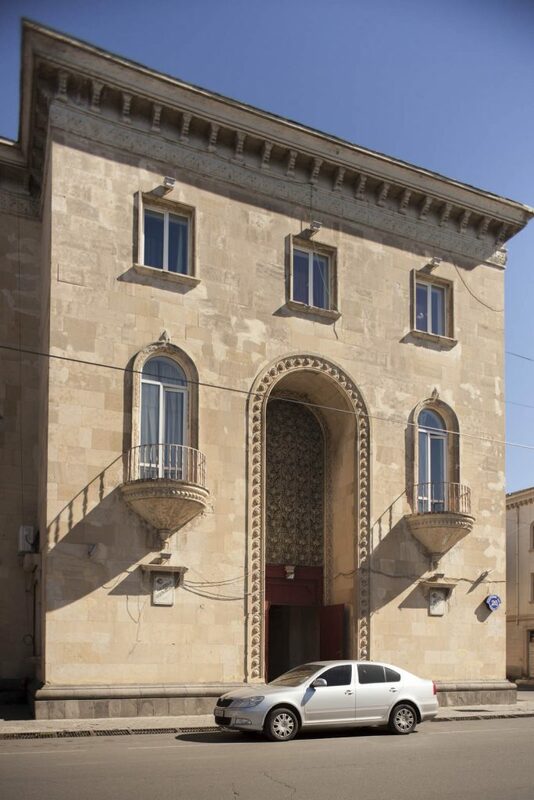 It belongs to the family of Manana Lejava De Surviladze, born in Tbilisi in 1942, which comes out of the family house next to the building. It is she who welcomes the few visitors that happen to hang around here, usually on the advice of Karaman. 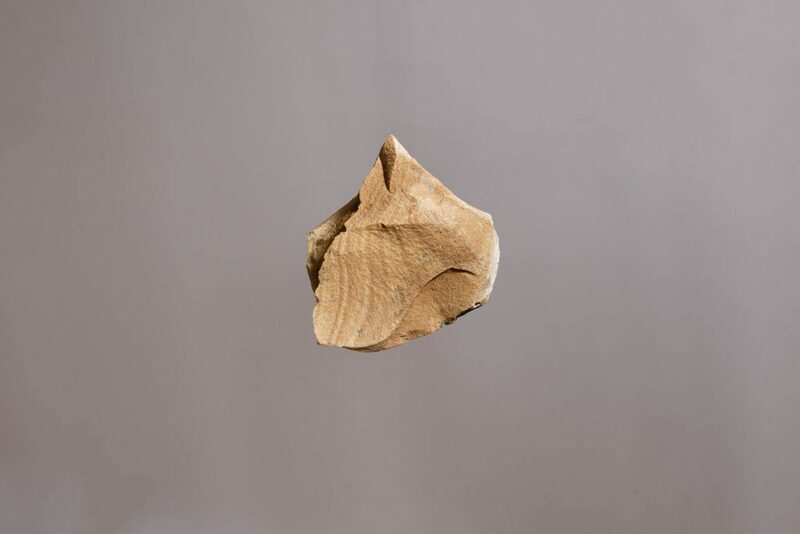 Manana immediately declares that her family was noble, in a glorious past when the region was dotted with castles and villas belonging to the most influential families. In her case, the reference ancestor is a military of high rank, who throughout his career had even been at the service of the Shah of Persia. Back at home he had built the palace, embellishing it with the decorative styles that he had appreciated during his travels. 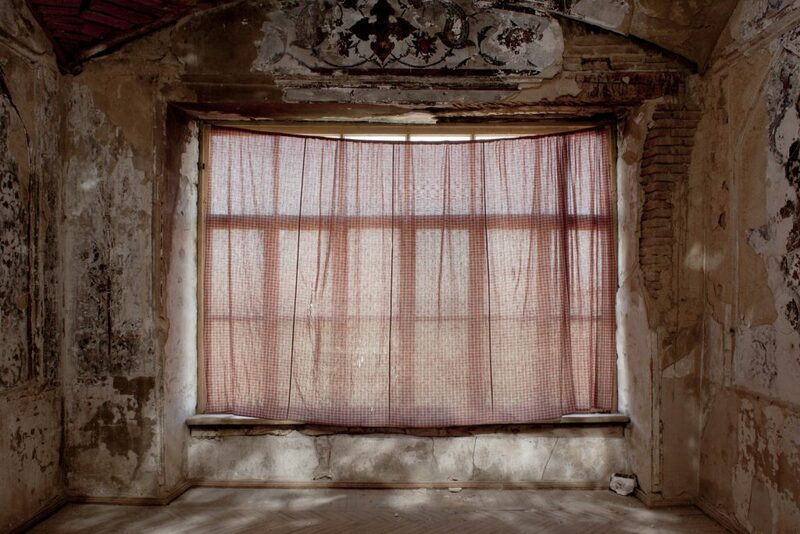 She tells me of a magnificent era, of dignitaries and high-ranking military, who gathered at the palace for social events and to enjoy the delicious wine of Kakheti, spilling out of a fountain in the large veranda overlooking the valley, and whose system of pipes and pumps is still visible on the lower floors. Apparently among the visitors there was even the Tsar Alexander III but Manana saw this glory only in the many photographs that she shows me, mostly set-up portraits, made in the studios of the master photographers of what, at least to her narrating and to me listening, it seems like a Georgian Belle Époque. Then everything changed. Around the 1910s the peasants, influenced by the ideas and backed by the resources of the Bolsheviks, had rebelled in uprisings against the proprietary nobility supported by the Mensheviks. With the birth of the Soviet Union the building was confiscated and used as barracks and storage. 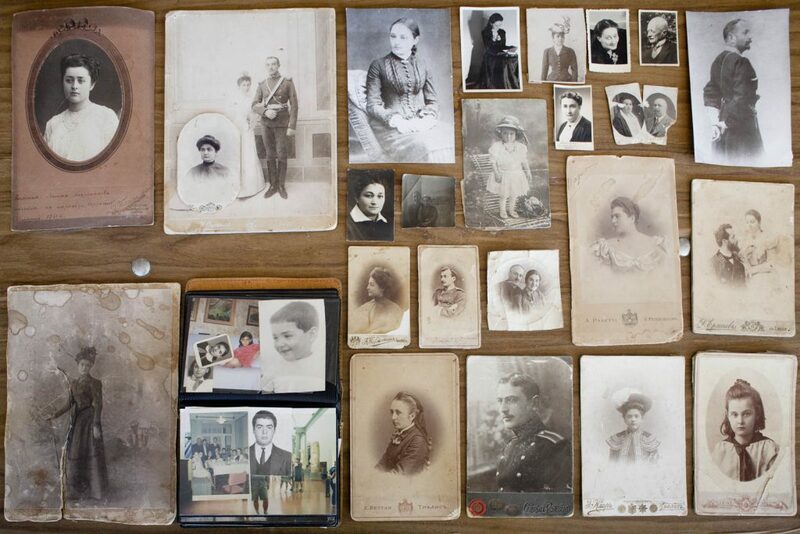 Returning vacant after the fall of the Soviet Union, it has finally returned to De Surviladze family who now tries, with great difficulty, to renovate it and make it profitable. Heading west along the Kura you get to Gori, the main town of Shida Kartli region, famous for being the birthplace of Joseph Stalin. In Stalin Avenue, opposite the Stalin museum, you can visit the small house where the dictator was born, monumentalised in Soviet fashion: a civil temple, with a colonnade and a five-pointed star in the center of a glass ceiling, literally embraces and protects the small house. A monument inside the other. Between it and the museum stands a statue of the dictator, much smaller than the one that first occupied the large roundabout in the center of Stalin Avenue, removed in 2010, during the succession of provocations and mediatic retaliations that followed the last Russian-Georgian war. One wonders if and how much the citizens are torn between honoring the memory of the illustrious statesman, and curse the misery that he caused and its consequences, including the bombing by Russian Migs in August 2008. However the museum is the destination of most of the skimpy tourist packages of the region and, as they say, pecunia non olet. 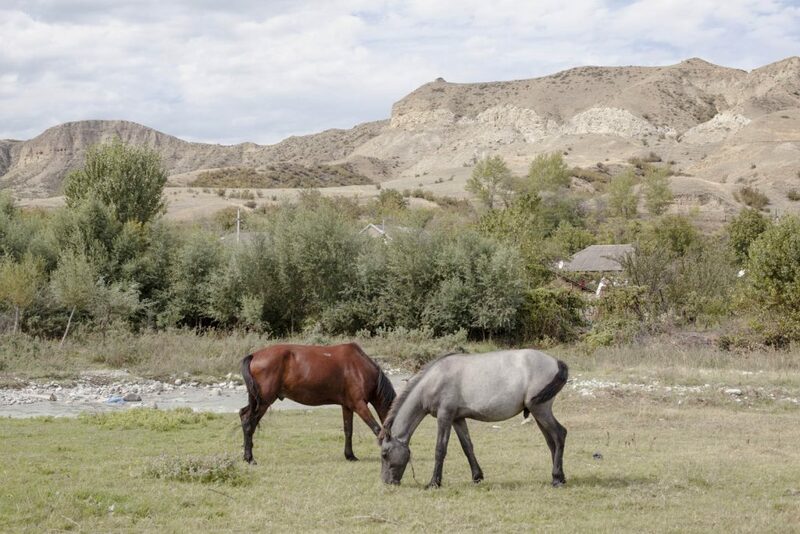 All around Gori, there are no specific economic activities, besides an agriculture that does not exceed local needs, while the valley and the surrounding hills seem dormant in a resigned economic depression, widely attributed to the Soviet original sin. On one of the sides of the hill, an abandoned mine testifies, for its size out of scale the past participation of the region to the Soviet economic system. These hills are rich in zeolite, a mineral of volcanic origin that, for its characteristics of microporosity, was used in industrial and agricultural applications, and that now (but not here) is used in natural medicine ingested raw to absorb and expel toxins. The inhabitants of the region, which used to give the mine a large part of the workforce, remember the peak of the extractions in relation to the Chernobyl disaster of 1986, when it was ordered in tons from Moscow to be transported to the contaminated site, where it was used for the construction of absorbent barriers and for the decontamination of the agricultural lands around the damaged nuclear reactor. 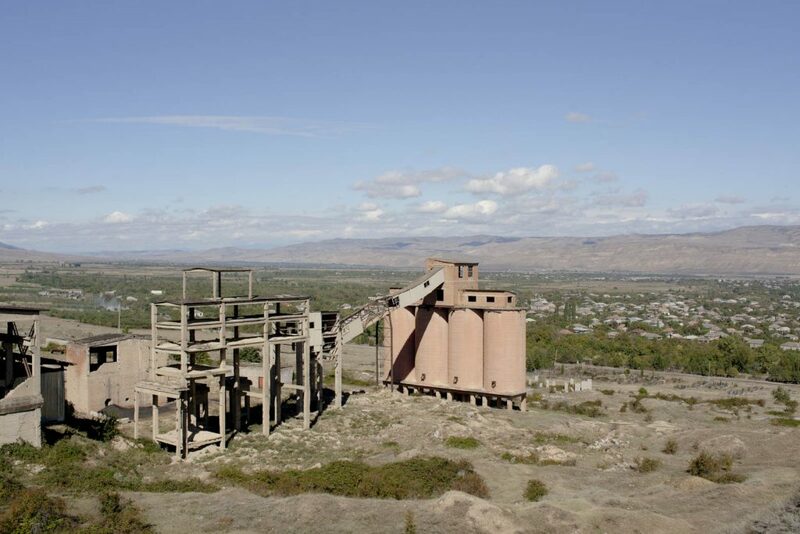 The mine, like many others in Georgia, was gradually abandoned with the dissolution of the Soviet Union and few Georgian companies are able to continue to trade the zeolite, usually in the agriculture supply e-commerce. A few kilometers north of Garikula I visit a village inhabited by those who, in the language of international NGOs, are indicated by the acronym IDPS, internally displaced persons, refugees in their homeland. An English sign notifies those passing that the European Union has not been with idle hands and donated the funds to provide the village with a water distribution system. The inhabitants are Georgian families previously living in South Ossetia, which during August 2008 were forced in one way or another to leave their homes without warning, and took refuge within the new national border, those that Google Maps shows dotted, being still of limited recognition. Very limited, considering that the UN, EU, OSCE, Council of Europe, the US and NATO consider South Ossetia still an integral part of the Republic of Georgia. In Shida Kartli refugees were housed in these villages built ad hoc by the government of Mikhail Saakashvili, president at the time and affectionately called Misha. The houses are in parallel rows, identical in shape and size and with identical gardens, inhabited mostly by the elderly and the children, since all productive age leave the artificial village as soon as possible, for working needs, or just to go away. And those who can, eventually leave Georgia looking for the European dream of its capital and the freedom of movement. For, beyond the local politicians and the geopolitical balance, the desire of Europe is much more understandable in this sense, perhaps the same as many other contemporary migrations: to abandon the outpost, the boundary between the worlds, in favor of the center and the inland privileges. These are probably the reasons for Giorgi who, as I write, has moved to Milan, in Italy again, within the continent on this side of the Kura river.